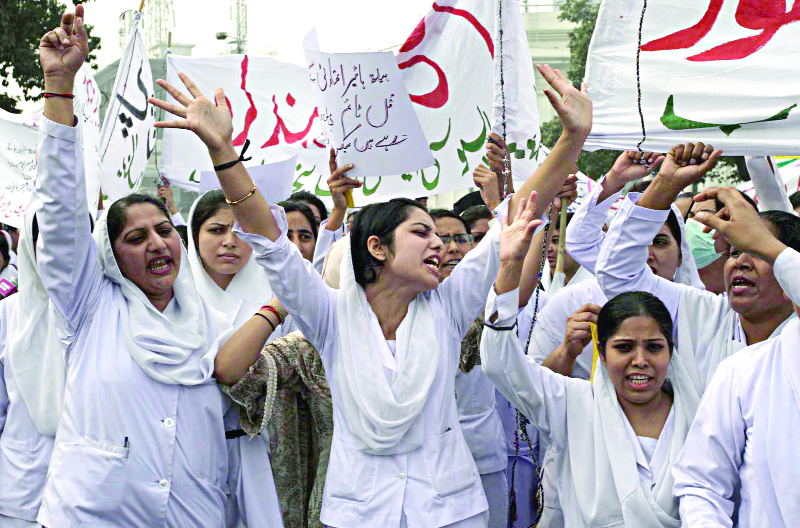 Breaching Section 144 on rallies at The Mall Road, hundreds of nurses staged a day-long protest and sit-in at Faisal Chowk in front of Punjab Assembly which was put off for today (Friday) after the government’s attempts to engage them in negotiations failed. The nurses, at the end of the day, burnt tires and announced to stage a sit-in at the residence of Punjab Chief Minister Shahbaz Sharif in Model Town today at 10am. Despite baton charge from police, the protesters succeeded in reaching the Mall Road and refused to leave until evening while they also turned down the offer of police to arrange their meeting with government officials demanding that the government representatives to come to the venue of the protest and deal with them in front of media. Irked by incompetence of the city government to ensure the implementation of ban on rallies at the Mall, traders also took to roads at midday and raised slogans against the DCO and the protesters. Braving the police charge, the angry nurses succeeded in getting to the Punjab Assembly where they stayed for rest of the day. They wanted government to implement the decision of enhanced salary package announced for them during the strike of young doctors. The nurses’ demands included salary package, promotion to higher grades, health professionals allowance and high risk allowance. Terming the notification of pay protection and seniority list for promotion as empty claims, nurses said they were being denied promotion despite passing several nursing courses while the seniority list would only benefit the nurses in service for decades and not those who were more qualified. They said they would stop working in emergencies also if their demands were not met. The Young Nurses Association office bearer said the government had not created new posts for nurses despite the utmost need for it. “There are far less nurses than required in hospitals per rules of Pakistan Nursing Council, while due to less number of seats many nurses are being denied promotion despite being many years in service,” Staff Nurse Shazia claimed. Sources said the Punjab Health Department had been negligent in this regard and had allowed the controversy to brew until the nurses stopped working in the wards of hospital. Parliamentary secretary for health, talking to media after the protest, said the government had already announced pay protection and allowances for the nurses and had invited them to meet a committee led by Hamza Shahbaz to discuss enhanced pay packages, adding that the nurses should not have gone on a strike since that created problems for the patients. Young Doctors Association Pakistan, YDA Punjab and Pakistan Medical Association condemned the torture of police and behavior of traders towards the nurses. Terming it immoral, Punjab YDA President Dr Hamid said it was the democratic right of nurses to protest and everybody should respect females. Pakistan YDA General Secretary Dr Salman Kazmi said the torture of police on unarmed and innocent nurses was unbearable and government was trying intentionally to lead the health professionals towards strike extension. Due to several protests in the city, traffic mess was seen at the Mall, its connecting roads and other major roads of the city. PPP, PML-Q, JI condemn torture on nurses: The Pakistan People’s Party (PPP), the Pakistan Muslim League-Quaid (PML-Q) and Jamaat-e-Islami (JI) on Thursday condemned the torture on nurses protesting for their demands while Punjab Governor Latif Khosa asked for a report of the incident. PPP Punjab Deputy Parliamentary Leader Shaukat Basra said that the torture was against human rights and a worst example of governance. He said that the PPP supported the demand of nurses for a salary raise and would raise the issue in the Punjab Assembly (PA). PPP Punjab Finance Secretary Aurangzeb Shaafi Burki requested the Lahore High Court (LHC) chief justice (CJ) to take suo motu notice of the incident. He alleged that Pakistan Muslim League-Nawaz (PML-N) workers disguised as traders tortured many nurses who were peacefully protesting at The Mall. PML-Q Punjab Parliamentary Leader Chaudhry Zaheeruddin said that the Punjab government’s bad governance and mishandling of issues was turning the situation worse and if such policies continued then people of the province would stand up against rulers. JI Deputy Secretary General Farid Paracha also condemned police torture on nurses. Chief Minister should take notice of nurses problems and solve it immediately in favour of patients and ladies. Eggs were thrown at the nurses by the traders of The Mall. Shame on these traders.